"Space Conquerors" by Alexander Deineka, reproduction. This year marks the 55th anniversary of mankind's first voyage to outer space. On April 12, 1961 Soviet cosmonaut, Yuri Gagarin, was the first human to orbit the Earth. Today, people in Russia still dream of the stars, and even space buffs and bloggers have begun making satellites. "Comrades! The Soviet land is now the shore of the universe," beams a smiling youth in an old poster. Behind him are the planets, the Kremlin stars, and a rocket flying into the sky. He holds a round-trip ticket to outer space and back to his homeland, the USSR. Several generations of Soviet citizens grew up with the thought that they'd write the Chronicle about the Conquered Universe. How is the Russian space industry developing today, and what has happened to this cosmic dream? Yuri Gagarin's flight in April 1961 was one of the USSR's first major achievements in space. But while the entire world was admiring the first man in space, the American government was feeling anxious. The R-7 rocket carrier, which carried Gagarin's Vostok-1 spaceship, had initially been designed to hit America with a nuclear warhead. In 1961, the Cold War as at its peak. Space was a field in which all the superpowers could demonstrate their might and flex their muscles, avoiding open confrontation. It was at this time that the USSR printed scores of posters with space themes. 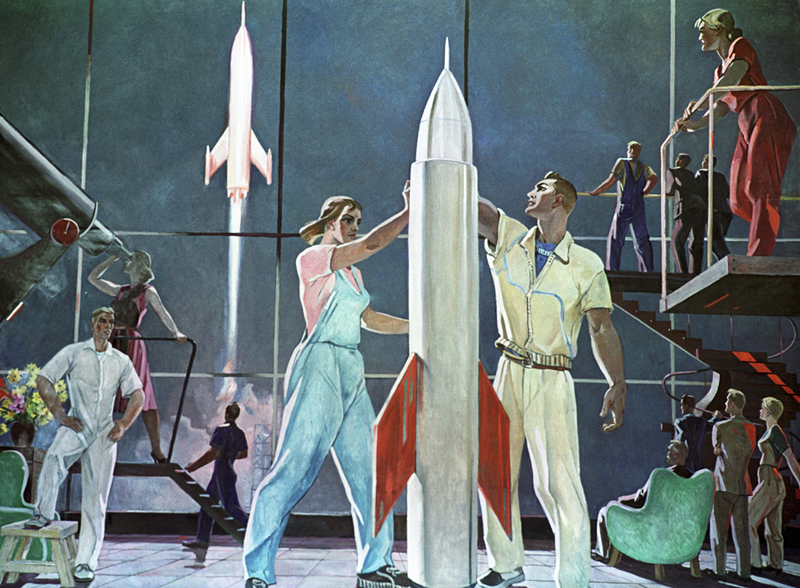 Space became a means to inspire the working class. In the early 1970s the Soviet leadership began to worry about the development of the Space Shuttle in the U.S., which wanted to develop reusable space ships for military purposes. The USSR was afraid that the U.S. would use space shuttles to carry nuclear weapons or steal Soviet satellites. In order not to fall behind, the USSR invested all its space resources to develop the Energia-Buran shuttle. Both superpowers spent enormous sums: the U.S. Space Shuttle program cost almost $200 billion; while the Buran cost about $16-17 billion. The Soviet Union's collapse, and the subsequent economic shock in the 1990s, changed everything. Due to its economic difficulties Russia halted its space shuttle project to focus on building the Mir-2 space station to replace Mir, which eventually plummeted to Earth in 2001. In June 1992, Russia and the U.S. signed an agreement for the exploration of space. Roscosmos offered NASA to build the International Space Station (ISS), which initially was an American, Canadian, Japanese and European Space Agency (ESA) project. Over the last several years astronauts from various countries have been flying to the ISS on Soyuz spaceships; although in 2015, SpaceX and Boeing received a $6.8-billion grant from NASA to develop a new transport spaceship by the end of 2017. According to Igor Komarov, the director of Roscosmos, there is full understanding between countries in the field of outer space. "Despite tensions on Earth, everything is completely different at the ISS," said Komarov. "We exchange research results, and scientific equipment. We have already agreed with NASA and the ESA that we will continue developing scientific programs together. In addition, Komarov predicts that the club of space states will only grow. "The doors will be open for countries that are just now beginning to study space," said Komarov. At the end of March, the Russian government approved its new space program for 2016-2025. One priority is the further development of the Russian segment of the ISS. Use of the station has been extended to 2024. Roscosmos is discussing the joint exploration of Mars with NASA and the ESA (the ExoMars project). In the next 10 years, however, Russia will focus on studying circumterrestrial space, space radiation and solar activity, and it will also prepare to explore the Moon after 2025. Roscosmos plans to send the first Russian to the Moon in 2030. "We need to solve many issues before setting off to outer space," said Komarov. "We will continue working on ExoMars, and we're convinced that we'll complete the second stage of the mission in 2018-2020." The main goal is to develop the orbital group of communication satellites and the remote sensing of the Earth, as well as launch new space modules for scientific studies. Yet, it seems that Russia's plans are nothing special in their ambition and scope. For example, the space program for the next 10 years does not even include the creation of a super-heavy rocket. "The Phoenix middle class rocket carrier, which should be completed by 2025, is the beginning of a long road to the creation of a super-heavy rocket; but in the near future it will not have any loads," explained Komarov. "Then why create it now? To say that we were the first? Well, we grew up a long time ago -- who's the first on the moon, who's the first in space. We have other goals now. We don't need these adolescent ambitions any longer." Yet, Russian cosmonauts believe that it is possible to colonize the Moon with technologies available today. "Humanity has made breakthroughs in the development of new materials, and new energy sources," said cosmonaut, Oleg Kononenko. "With the help of modern technology we can colonize the Moon. In any case, it's necessary because resources on Earth will sooner or later run out, and this will convince humanity to explore the Moon and Mars." In the past few years private space companies have appeared in Russia. For example, Dauria Aerospace develops, assembles, and launches small satellites. Space amateurs also reach for the stars. They raise money for their space projects on crowdfunding platforms. In the beginning of 2016, a group of enthusiasts and bloggers raised almost $29,000 on Boomstarter to launch a space probe to the Moon. Their goal is to photograph the places where the American Apollo spaceships, and the Soviet Luna and Lunakhod robotic lunar rovers landed. This year Russian scientists from the Moscow State University of Mechanical Engineering plan to launch the Mayak mini-sputnik, which was also built thanks to crowdfunding. The project's goal is "to show that space is close and attainable," as well as to test technologies that can solve the problem of space debris. In the middle of March the private company, CosmoCourse, received permission from Roscosmos to develop a multi-use system for sending tourists to space. "Requirements for tourists will not be very stringent," promised CosmoCourse' general director, Pavel Pushkin. "They will have to take a medical exam to see if they are predisposed to serious illnesses, and they must have a test run in the centrifuge. Afterwards they can sign a contract with us." The company plans to launch its first voyage in 2020. Ticket prices will range from $200,000 to $250,000. It seems that after a long period of time, just as Soviet citizens once dreamed, the stars are getting closer --- but only if you can afford to pay.